(l-r) Lily James is Cinderella and Cate Blanchett is the Stepmother in Disney’s live-action feature CINDERELLA. ©Disney Enterprises. CR: Jonathan Olley. 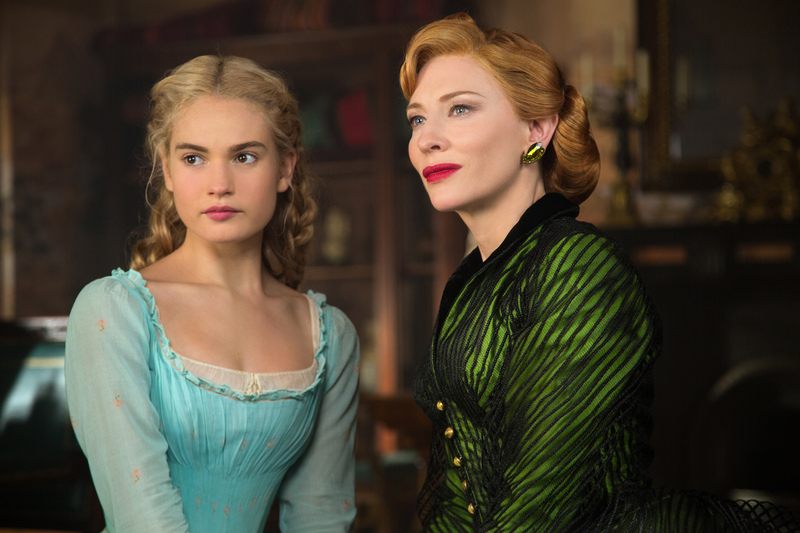 HOLLYWOOD—Lily James knows a little something about playing beautiful, elegant characters from a bygone era. After all, she stars in the smash hit Julian Fellowes-penned TV series “Downton Abbey,” as Lady Rose MacClare Aldridge. She now sets forth into the fantasy world of Disney’s live-action “Cinderella” in the title role. The 25-year-old Brit recently spoke about the role, in which she plays Ella, the orphaned daughter of a farmer, whose widowed second wife (a frightening Cate Blanchett) treats her like a servant. While out in the forest one day, she meets a handsome horsebacked fellow who calls himself Kit, with whom she has an instant connection. She doesn’t realize, of course, that Kit is the prince of the kingdom. Later, she wants to attend a fancy ball hosted by the prince (Richard Madden), who is determined to find the mysterious girl he met in the forest, but thanks to her mean stepmother she doesn’t have anything appropriate to wear. Voila! Her fairy godmother (Helena Bonham Carter) shows up and not only dresses Cinderella to the nines in a drop-dead gorgeous blue gown (created by Oscar-winning costume designer Sandy Powell), but also finds her transportation to the grand soiree at the palace. Dancing ensues. A glass slipper is left behind. And an exhaustive search to find the owner commences. Q: Is it a childhood dream to be Cinderella, to play a princess? James: I love princesses. I had a princess Jasmine outfit when I was seven. I had little plastic princess slippers. I really loved princesses growing up. I was definitely one of those girls but then I had two brothers that kept me from being too (girly). They were always knocking me off my pedestal a bit. I hadn’t carried that through life; I didn’t still want to be a princess. I originally auditioned for one of the stepsisters, but once I started reading Ella and I was totally desperate to play her. Q: Ella possesses the qualities of kindness and courage? Do you feel like you have those qualities as well? James: I hope so. I think we all do. I think we have to to sort of get through life. What’s amazing about Ella is that she’s like the best version of herself at all times, and that’s what remarkable about her. Q: Before you got out on the ballroom floor with that magnificent blue gown, did you practice with a smaller skirt? James: You would have thought we would have done that, and I really wish we did. I was in heels and a little strappy top and Richard (Madden, who plays the prince) had the same strappy top. We practiced for months. Every weekend we went to Pinewood Studios in London. We had these amazing teachers and we were getting really smug and really good at it and then suddenly we were like, “Oh, the dress!” I put it on and I had a complete nervous breakdown. I was thinking, “This is never going to happen.” And that was just the cage (that holds out the skirt). That wasn’t even the 12 layers of gossamer thin silk that basically ripped when you looked at it. Then there was the corset, which meant I could only breathe up here (pointing to above her chest). The dance is quite long and quite athletic, but somehow, through Disney magic, it worked out. 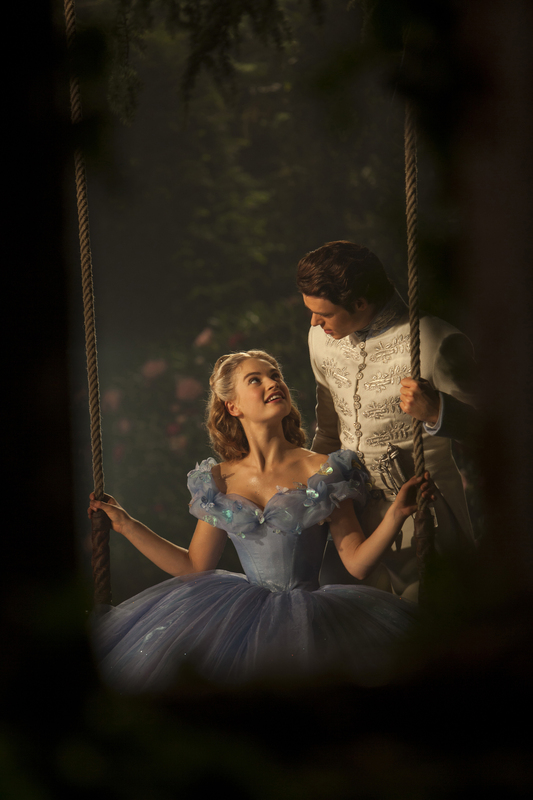 Lily James is Cinderella and Richard Madden is the Prince in Disney’s live-action CINDERELLA,. ©Disney Enterprises. CR: Jonathan Olley. Q: Who had it tougher—you or Richard? James: Richard had to basically ice skate, because if he picked up his feet he would step on the skirt. He had to go to the gym, because to lift me in that dress was really hard. When he pushed me on the swing you could see him (gasping). There were definitely casualties (practice dresses) and (costume designer) Sandy Powell holding her breath in the corner. She had to make different length skirts. Sometimes, I wouldn’t have the skirt on if it was a high shot, I’d just have leggings on. Yeah, it was so good to do but it was really hard, and you’d turn and the fibers in the skirt would catch up with you and hit me in the face, and yet I’m trying to look like I’m really enjoying it. Towards the end, we did it a few times from start to finish, from me arriving on the top steps of the ball to running off, we did it seriously without stopping. It felt like I was falling in love; it was really magical. Q: How did you endure that corset? James: Blood, sweat and tears. Thankfully it was only really tight in the blue dress. I wore the corset throughout the film but it was fine. In the blue dress, it was designed so that it was really pulled in at the waist but also the fact that the skirts so big it’s almost an illusion it looks way smaller than it is. I’d untie it at all the breaks and stuff, but that’s just the nature of corsets. I’ve done lots of period filming and it’s the same throughout this wasn’t really any different. Sometimes they’re tight on your breast like in “Restoration,” and that hurts even more. In “Downton Abbey,” it’s the ‘20s and that era is worse, seriously. 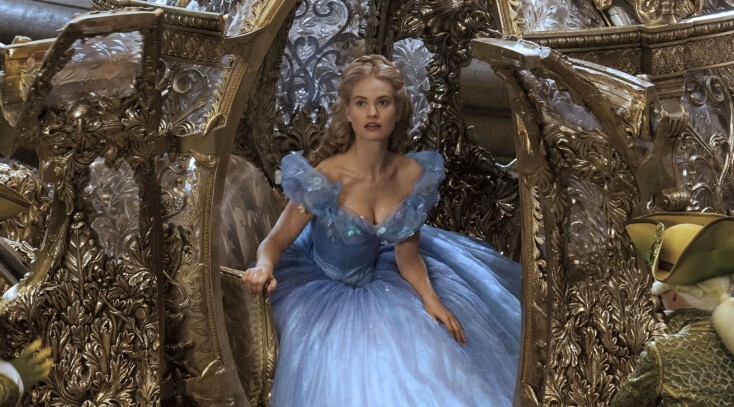 Whilst filming “Cinderella,” at lunchtime I would untie the corset so I could eat but I had soup and stuff so it would go down or I would have barfed in Richards face. Diet Coke was my only way to get through filming because I get so tired. I’d drink it and then have to apologize to Richard for burping. Helena (Bonham Carter) was exactly the same. When we shot our stuff together, it was like this symphony of burps. Q: Did you take any inspiration from playing Lady Rose for your role as Cinderella? James: Rose is kind, especially as she’s developed, so I guess there is a similarity. I actually want Ella to be very different from Rose. She’s so much calmer and more grounded. But I think it’s kind of impossible when you play a character for a long time. They kind of infiltrate you as a person. You’re like, “Get out, Rose! Leave me alone!” (She laughs.) In the first scene of the film I was like, “Oh no, you’re being Rose.” I was ready to start and then I felt like she went away. Q: You probably grew up admiring Helena Bonham Carter, who plays your fairy godmother, and Cate Blanchett, who plays your evil stepmother. What was it like working with them? James: It was an unbelievable, very surreal experience, so I’m so grateful. Cate is one of the great actresses of all time, so to do scenes with her was, in a way, easy because she gives you so much, For the stepmother, there was this whole life and history and the world that went on inside her and in her eyes. It was just so exciting. It felt so layered and multi-dimensional. I loved doing scenes with her so much. James: Helena is one of the coolest kindest women I’ve ever met. We had so much fun. She has the best sense of humor. I loved her fairy godmother. It came at a point during night shoots where I was exhausted. It was trippy, weird and cold. We were outside when Ella says, “I don’t believe anymore,” like, she almost given up hope, which is how I was feeling, and then Helena showed up. It was like this bright light on the horizon; it was wonderful. Q: How was it collaborating with director Kenneth Branagh on this? James: Unique. I’ve never had it quite like it before. I trusted him completely, which is the most sort of scary feeling because you sort of go, I’m giving over to this director and I believe in him, but it’s also the most freeing experience. I felt like I could do anything and he could control it. He was guiding me through it. He directs with such heart and such warmth, and he’s very clear and specific. Right from my first audition, he spoke about Ella and how he wanted her to be. He always talked about where her goodness comes from. It can’t just be this abstract idea of she’s a princess so she’s good and sweet and doe-eyed and floats around on clouds. No, he wanted me to show why she this girl and what does it cost her, and how does she maintain this goodness. Q: As someone who grew up watching Disney princesses like Jasmine and Belle, how did you feel about having that as an inspiration to create this character? James: Yeah, I’ve watched all the Disney princesses and it’s amazing how they’ve changed and they have become more modern, right up through “Frozen.” I’m such a geek now with princesses. There’s that desire for more in life, to want to explore, to want to you know daydream. I feel like that spirit of princesses that they’re great role models, they’re great inspirations for kids because they’re outside of societies in a way, they want, they don’t settle. Ella is this kind, good person that is able to be happy in a cruel environment and because of it, that it is her superpower. Q: Are you prepared to become an icon to children? When they see you they’re going to look at you in awe. James: All I know is that when I went to Disneyland as a kid, I had my Mickey Mouse autograph book. I went round to the teenage girls that were dressed up as princesses and that transaction is beautiful, it’s magical, and if I can be a part of that I feel really thrilled. I saw a cool interview with Amy Adams years ago when she did “Enchanted,” and she said something like she’d be out in her jeans and no makeup and kids would be like, “Mommy, look,” and she’d have to say, “ I’m on my off day, I’m in disguise.” So I think I might have to do that, because I go around in ripped jeans. Q: You’re going to be going back to work on “Downton” soon. Have you guys heard anything more about this being the last season? There have been the rumors that this may be the last one. Do you know anything about that? James: I don’t know; I hope not. I hope shooting keeps going forever. I love it. I also think at a certain point, we can’t age that much. Q: Are you excited to go back and see what show creator Julian Fellowes has written?